During this retreat I would like to go deep into myself, leaving all the different layers behind. I know that deep down in the very bottom of my heart a treasure is waiting for me. I can find it by the process of “spiritual archaeology.” I feel that this treasure will give me the strength required to deal with the compromises I make in my life that keep me in the so-called comfort zone. It is a dangerous zone that gets darker each time I act in a way contrary to what I know to be true. But the young boy told them: “Either you come with me or I will never speak to you again.” In this way he forced them to come along. They walked for a long time and arrived later the same day. They found themselves at the side of a deep well. The boy told his oldest brother: “I want to put a rope around your waist and lower you into the well. Look carefully at what you find at the bottom.” When the oldest brother was only one-third down the well he began to scream and cry. Fear to face the darkness and loneliness inside the well attacked him from all sides: “I’m dying! I’m dying!” Hearing his cries, the young boy pulled him out because he saw what kind of person his oldest brother was. Next the middle brother was hoisted down into the well. He went halfway down and then he also began to scream, “Help! Help! Save me! Bring me up!” The youngest brother, seeing what kind of person his middle brother was, pulled him up. When the youngest brother’s turn came he said, “Listen. Even though I may cry and scream, don’t pull me up. 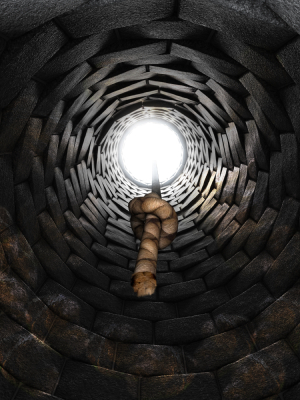 Lower me down into the well until you feel there is no weight on the end of the rope— then you will know that I have reached the bottom.” His brothers pleaded with him: “You are our youngest brother. Why do you want to leave us?” But the boy was firm, and they lowered him by the rope until he reached the bottom of the well. I first heard this story from my grandfather when I was a young boy of sixteen years, and I remember that I became intrigued. I wanted to know how the story would end. But my grandfather surprised me. He looked deep into my eyes and said, “It’s not just a nice story about someone else. It should become your story. What will you find, when you go down that well to the bottom of your heart?” Shortly afterward, I decided to move into a temple to seriously start my spiritual journey. We have become expert at filling our lives with the noise of ten thousand little things. We are always surrounded by a hum of activity coming from our fast lives. Even if there is nothing going on around us, our psyche continues to vibrate from the joys and frustrations we experience. The modern person finds it very difficult, therefore, to be alone with him/herself. Always some diversion is needed; some TV, some music, some talk, etc. The French mathematician Blaise Pascal once wrote: “All man’s miseries derive from not being able to sit quietly in a room alone.” That was the problem of the two brothers. They felt scared when they had to go deeper and separate themselves from the usual noise of their busy lives. Our spiritual journey will bring us through lonely places—places we have never been to before. Sometimes these inner regions are so lonely that we may not immediately find recognizable sign posts to tell us which way to go. At that time, we have to struggle to orient ourselves and sometimes, even when we think we finally have found the sign posts, we might find that we can’t read them. When that happens, we have to turn to Krishna (the All-attractive Supreme) in all seriousness. In Sanskrit the heart is sometimes metaphorically referred to as ‘guha’, meaning a cavern, cave or a deep and secret place. With this in mind we turned to the cave and began our descent. One of us waited outside. King Muchukunda physically went into a cave in the Himalayas where he rested his battle-tired body and waited for the Lord to appear. After a long sleep he finally awoke to find Lord Krishna standing before him, illuminating the cave with His effulgence. Overwhelmed with gratitude Muchukunda prayed: “With your effulgence you dispel the darkness of this mountain cave, and with your jewel like knowledge you destroy the darkness of ignorance in my heart.” (Sharartha-darshini 10.51.29). In much the same way, anyone who goes to the bottom of the heart-cave will meet the Lord there. 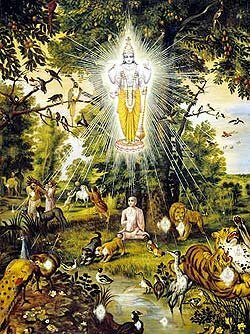 He is described as “sitting unseen within the cave of the heart like the fire dormant within kindling wood” (Shrimad-Bhagavatam 11.37.10–11). Krishna is the Supersoul who dwells within the heart of all living beings. Even though we cannot always see Him with our covered eyes and conditioned mind, He is there, hidden just like the fire within wood. And just like there is an ancient process for kindling fire from within wood there is an ancient process by which we can discover the Lord and experience His presence more and more in our hearts. The Brihad-aranyaka Upanishad tells us: “One must see the Lord, hear about Him, think about Him and meditate upon Him with fixed concentration.” (Brihad-aranyaka Upanishad 4.5.6). Born in Hamburg, Germany, in 1954, Sacinandana Swami is a disciple of Sri A.C. Bhaktivedanta Swami and a sannyasi (monk) in the Gaudiya Vaishnava Sampradaya. He has developed a number of innovative programs for sharing devotional knowledge with large audiences thoughout Europe. He has also spent many years on pilgrimage, developing his own personal sadhana and sharing the sacred places with others. 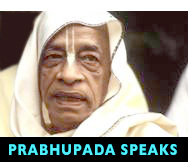 His publications include The Nectarean Ocean of the Holy Name, The Gayatri Book, The Way of the Great Departure, The Art of Transformation, Spiritual Tonic, and Divine Names, a double CD with bhajans.